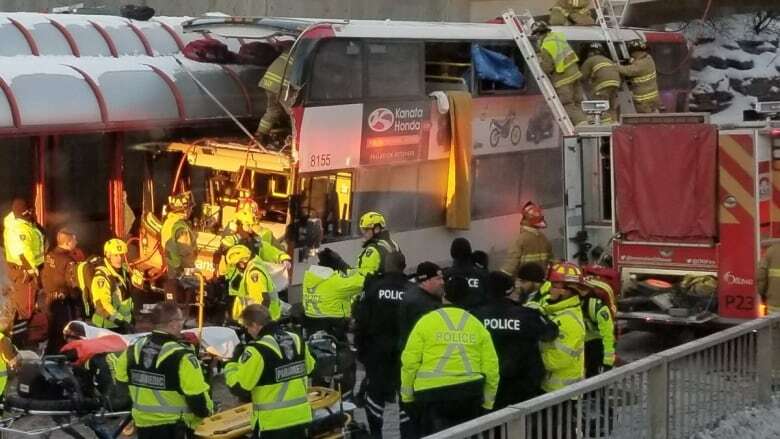 Nine employees with the Department of National Defence were involved in Friday's horrific bus crash on Ottawa's Transitway, the department confirmed Tuesday. There were four Canadian Armed Forces members and five civilians involved in the collision at Westboro station. The three people killed in the crash were also public servants. Anja Van Beek, 65, worked for the federal Treasury Board, Bruce Thomlinson, 56 worked for the Canada Border Services Agency, and Judy Booth, 57 was retired, but still worked occasionally for the National Capital Commission. In a statement sent to all DND employees Tuesday afternoon, deputy minister Jody Thomas and Chief of Defence Staff Gen. Jonathan Vance said they're doing everything they can to support their employees. "This has the potential to change their lives forever and we are keeping them and their families in our thoughts as they begin to heal. We are also reaching out to those affected to make sure they receive the fullest support we can offer," reads the statement. Thomas and Vance encouraged all DND employees to take the time they need to deal with their own emotions and to help one another. "Take the time you need to talk about this with each other, with your supervisor, or with your friends. Above all, take care of one another."